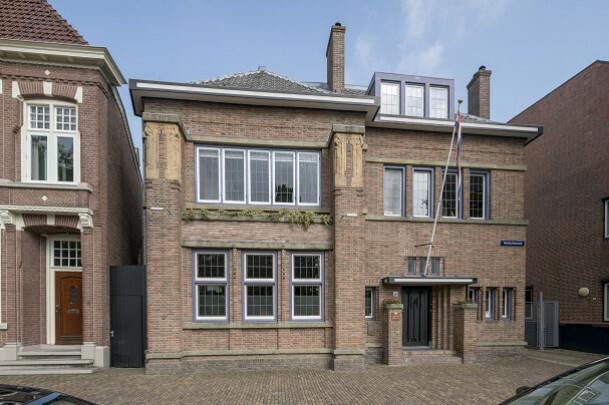 Although Jan Wils had lived and worked in The Hague since 1913, the commissions to build in his birthplace Alkmaar kept coming. In December 1916, he designed a house and practice for the notary J. de Lange. The Wrightian front facade boasts two pilaster strips, vertical projecting wall decorations with sculptural work by Willem Brouwer. Wils called in Theo van Doesburg to design the interior. After Van Doesburg had provided three stained glass windows for the hall, he created a ‘destructive’ colour scheme in purple, green, red, blue and white that in all probability was only partly executed. The present occupants have reinstated the original interior as much as possible. The original windows are in the collection of the Stedelijk Museum Amsterdam.